Cebu Pacific Promo Fares 2019 to 2020: 1 PISO FARE for MAY 1!!! Cebu Pacific Promo Fares 2019 to 2020. The latest Cebu Pacific Promos are here! As well Cebu Pacific Piso Fares, Piso Sale, and other promos. 1 PISO FARE for MAY 1!!! 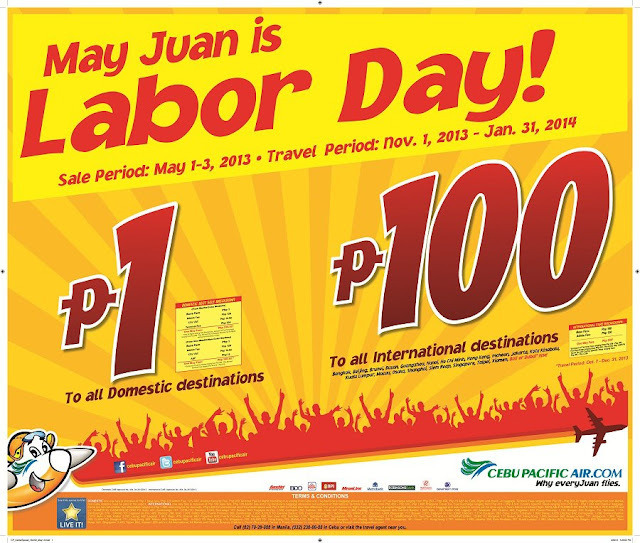 Log on to our website at http://www.cebupacificair.com/ to book your tickets, NOW! Do not forget to read our seat sale terms and conditions! please be advice how can i avail this promotion? Pano po mag avail? Going to boracay po birthday namin ni mama q sa May 1 tapos aq po May 2. 100 Lucky Passengers For DUBAI! Promo Fares 2013: 75% Off! This is an unofficial blog for Cebu Pacific's promotional fares. However, all contents and information on this site is been referred to their direct sources after each post for your reference.